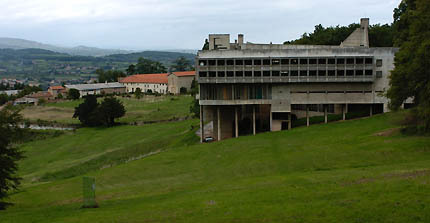 The Dominican Monastery of La Tourette is Le Corbusier's last major work in Europe. Its program is unusual - a complete, self-contained world for a community of studying, silent monks, living a life so austere they are sometimes known as the 'begging brothers'. To support this community, the Monastery comprises 100 individual 'cells', communal library, classrooms and refectory, a rooftop cloister and church. 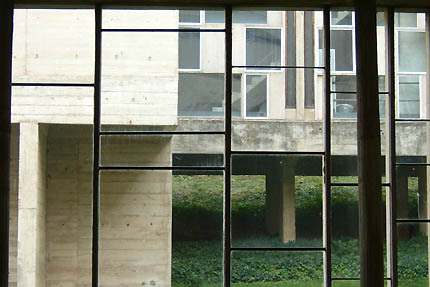 Many of Le Corbusier's long-established practices are here: the pilotis (load-bearing columns) inside the walls freeing the facade of the walls for long strip windows, the grassed rooftops and the carefully planned 'architectural promenade' with ramp, all go back to the Villa Savoye thirty years earlier; but the austerity and spirituality of the monks' life gives a very different outcome. 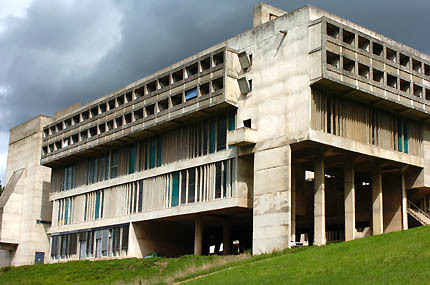 Above all, Le Corbusier was trying here "to give the monks what men today need most: silence and peace... This Monastery does not show off; it is on the inside that it lives." Judging from the monks' reactions, he succeeded well - despite many practical reservations about the size of some of the cells, the soundproofing and acoustics, and many maintenance issues that are very visible today. Despite all this one student monk among those first occupying the Convent compared his entry into the Corbusier building to a second entry into religion. 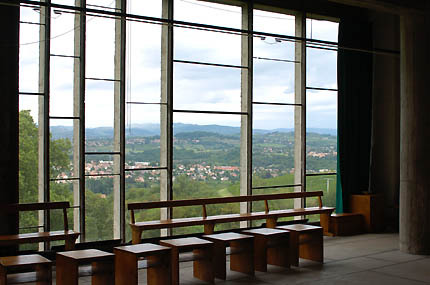 Much of the atmosphere of the building, inside even more than out, comes from the carefully proportioned floor-to-ceiling glazing used in many of the public areas - the Chapter room and refectory with their commanding west-facing views over the valley, the library, and approach to the church. 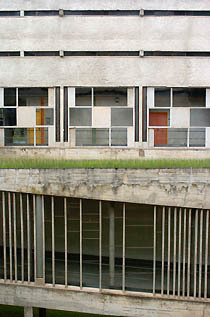 The unevenly-spaced ondulatoires (the vertical concrete mullions) and the similarly uneven horizontal divisions between them were designed according to Le Corbusier's Modulor system of proportions by Yannis Xenakis, a musician as well as an architect, applying musical principles of harmony and rhythm. 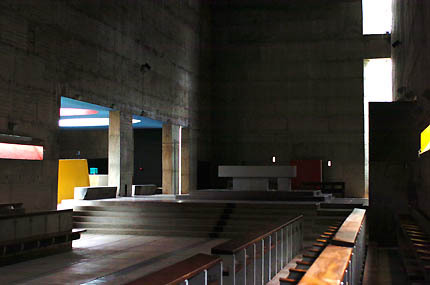 The climax of the architectural promenade is the ramp down to the entrance to the church: an austere, concrete corridor but for its unevenly-rhythmic glazing, leading to a stern metal wall, which rotates to give access to the dark, colored glow of the church beyond. 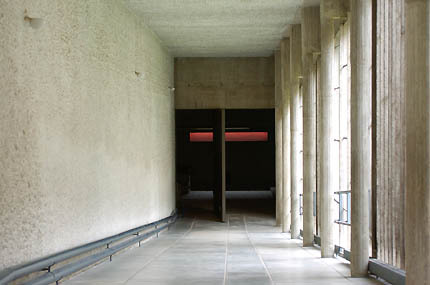 In the church itself, a tall, plain, concrete box is given spiritual life through selective and careful use of natural light and subtly strong color. Daylight is admitted through five different types of opening around the church, several of them sculpted outside, creating distinctive "light cannons." Strong but deep colors within some of the openings give the church a warm and moving glow. The whole Monastery is set on a steeply sloping bank within its grounds, on a spot chosen by Le Corbusier. 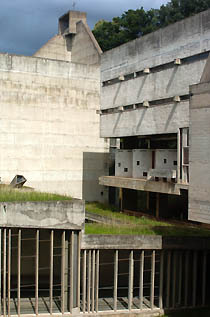 Each of the hundred cells has an outward-facing balcony, with the communal areas beneath, and the cloister, unconventionally, running around the roof. The Monastery is about 25 kilometers northwest of Lyon. To get there by car, take the A6 motorway north from Lyon, until the "Limonest" exit (33) Take the N6, then shortly turn left onto the D73 to cut across to the N7. Follow the N7 to L'Arbresle, then follow signposts to Eveux and to the Couvent de La Tourette. To get there by train, take the Roanne train from Lyon to L'Arbresle station, then use a taxi. You can call a taxi on +33 4 74 26 90 19. The Monastery offers frequent, friendly and informal tours in both English and French. It is also possible to stay in the Monastery, in the austere and studious spirit in which it was designed. For more information please visit www.couventlatourette.com, telephone +33 4 74 26 79 70, or email culture@couventlatourette.com. The Monastery is due to undergo significant restoration during 2005, so please check on its status at the information points above before traveling.